JEN: LOL, Mari! That’s like my son would almost always write the opposite of whatever the writing prompt was. He did get a visit from the school counselor (without my knowledge until after the fact) because he wrote why he was not proud of himself when the assignment was to write why he was proud of himself. I let the teacher know how I felt about that and reminded her that the entire year he had been writing the opposite of whatever she assigned – still it was “the law” that she had to do that. Yep – angsty rebellion pretty much sums up his entire public school career. I loved reading Shamus’s book, because a lot of what he wrote about his dislike of worksheets and what he thought about school was like being able to get a glimpse inside my boy’s head. And … I’ve derailed your thread about coloring. MARI: LOL, not at all, Jen. It was a thread about how sad that picture made me and why. I’m not a “stick to one topic” kind of person – I love when threads go all stream-of-consciousness. One of my daughter’s “scribbles” stories was about a serial killer that killed every member of her class except her. I just knew that was going to get us a call or a visit from CPS or the cops or something. Luckily, I don’t think the teacher ever figured out that in the story, my daughter was the serial killer. JACKIE: Ironic that they think something is wrong at home, but it might just be the school causing the angst. CARMA: If my 17-year-old daughter were in public school she could NEVER turn in anything she writes or draws! Very gory. REBECCA: My son went to a private preschool and his teacher was constantly making him redo his coloring pages because he would scribble just because he didn’t like coloring. It was such a frustrating experience for us both (and the teacher too). KATIE: that was one of the reasons I had no problem letting my little one stay home to homeschool after Kindergarten. Their teacher made them throw away their violet crayons at the beginning of the year so they wouldn’t use them. They had to use blue or purple, not violet. I remember her crying one morning on the way to school and panicking that we had to turn around and go back home, or to the store, because she HAD to have a brown crayon or she was going to get in trouble. That was it for me. CINDY M: During my youngest son’s brief time in Kinder, I was helping in the classroom when the teacher walked up to a little girl and informed her that “That is NOT how you draw a tree and those are NOT the right colors! Do it again!” I was horrified. We lasted about another week. CINDY S: I was helping in the 4’s and 5’s class at church when the teacher told the kids first they had to use a pencil and trace the words before they would get a crayon to color. My son chose to color first, and never traced the words … why is Sunday School so much like school now? I saw the picture above and associated the smiley faces with performance and acceptance … yuck. BOBBIE: My uncle’s teacher gave him a black and orange crayon to color a jack-o-lantern one year. He got in trouble because the pumpkin turned out black with orange eyes and mouth. When asked why he didn’t do it right, he told her that his pumpkin was old and rotting. I love how children see everything differently, how it is not all cut and dried one way only. I feel sorry for this teacher. HEATHER: I got in trouble often (poor grades trouble rather than verbal trouble) because I was always working on a completely different project than what the teacher asked. So in third grade, when we were asked to draw a page of faces showing six different emotions, I had just figured out how to draw proper lips and eyes and nose but hadn’t yet figured out how to make those convey emotion. Being an idealist I insisted on drawing and redrawing the same face that I had just figured out but couldn’t force myself to “break it” by making a stupid smiley face, frowny face, etc. I wanted my drawing to show my skill and what she was asking was not yet in my skill set yet therefore I just drew what I was working on instead and got an F for not following directions. I explained to the teacher and she understood but still gave me an F for not following directions. That sort of thing happened a lot. And it took me YEARS to get beyond doing realistic art work (especially since my realistic art work was the only sort that ever gained recognition). K.M. : This is a great topic because this is actually one of the top five reasons we started homeschooling… honestly! I always tell people that even though I am a Christian it is not because of religious reasons. Even though I am against bullying and school shootings, that is also not the reason I homeschool because that can happen anywhere. But, I hardly ever tell the real reasons because most would find them superficial. But, they are important to me. I am an artist and I just could not take my son not getting a smiley star on his coloring page because he didn’t stay in the lines or he used the wrong colors. This was first grade actually. Also, he would get a math problem correct, but she would mark it wrong because he wrote the seven or four backwards. And he would get in trouble for holding the door for a classmate because he was not in line. 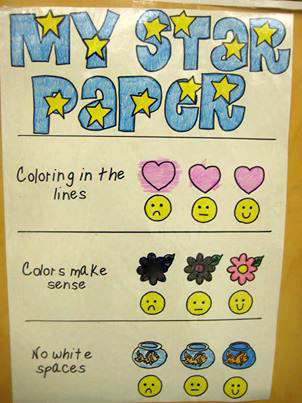 On the coloring, I would just tell my son that it was wrong for the teacher to not give him credit for his coloring page or not give him the smiley star because he colored it how he wanted. One thing he would do is draw swirls all over his paper over the page. When I asked him what the scribbles were (thinking he was mad or something) he said the scribbles were rain or wind or a tornado, etc. The teacher never asked him what the scribbles were. He is a great artist now that I let him be creative. I make sure to tell him that in art there is not right way to draw. First grade was very frustrating for my son. But, I have to say that both my son and daughter had great Kindergarten teachers who did not try to control of conform them. It was just first grade where we had the frustrations with this. And it was one of the top five reasons to take them out and homeschool. IL: One of the reasons, I believe, so many adults draw “stick figures” is because someone told them, when they were young, that they couldn’t draw, they were doing it wrong or it was stupid. Their abilities seem to be “stuck” at around five years old. I used to work at a food bank and I often would entertain the children when the parents were getting their food. I would draw with them and I was amazed at how many would say, “I can’t draw,” and would not even pick up the pencil or crayon. I would tell them, (from what I learned from my wonderful, encouraging art teacher in elementary school), “If you can make shapes you can draw.” Within five minutes, I would have them drawing wonderful pictures. I would only be with them for a short time, but it was so rewarding to watch them go away happy with what they had created. I have always encouraged my son to be creative. I do believe in giving children the right tools and showing them how to use them. For example, I can’t stand those big huge paint brushes made for little kids. It is so frustrating to watch a child try to paint a picture and not be able to make the details they want. I always gave my son all sizes of regular brushes and showed him how to use them. One of his favorite things to do, starting when he was about six, was to watch Bob Ross, which I had recorded. He would pause the recording every few minutes, paint and then hit play. Too many underestimate just what a child is capable of. CHRISTINE: My mother and I got into it years ago because she was trying to punish my child for coloring a green cow. I told her to mind her own business and she got very angry. We don’t see her anymore, but for other reasons in addition to this. AMY: I volunteered in my sons’ (ages 3.5 and 4.5) Sunday school class a few weeks ago and when it was craft time they were supposed to be drawing certain things on a worksheet—it was matching things up—we were talking about how to show love to others so there would be a picture of a baby and you would have to “match” it with the blanket shown at the bottom of the page but instead of drawing a line to it you were supposed to actually draw the blanket next to the baby. I could tell that my older son was attempting to copy the pictures even though they sometimes didn’t look at all like what was shown, but my younger son was just coloring. He was having a ball, they love to color. Anyway, it wasn’t the teacher that said anything, but it was one of the other kids who kept saying, “Hey, you’re supposed to be making a blanket!” or a dog dish or whatever it was. It was kind of driving me crazy. Luckily I don’t even think my three-year-old noticed, he has always done things his own way and has never cared about the normal way to do anything or what other people think. I hope that he stays that way throughout his life. My kids are not elementary school age yet and sometimes I find myself questioning whether unschooling will be the best thing for us (I am all about the educational philosophy part of it, but I just wonder if I will be able to hold up my end well of helping them pursue things and providing them resources, etc. since we have a large family and I feel overwhelmed sometimes to think about doing things beyond our normal day-to-day things), and then I see things like this and realize that my kids are learning so much more just by having the freedom to color in the way that they want to here at home than they would be learning at a school where these types of conformity coloring things take place. MARI: Amy – I just want to encourage you that your “normal day-to-day things” are just exactly what your kids need and that’s so foundational to unschooling. Unschooling isn’t about your ability to visit a different museum every day or to come up with a different creative craft based on a Pinterest pin or blog post every day – it’s about finding the learning IN REAL LIFE, which is the normal, day to day things. Yes, enrichment and resources are great and I suspect that in time you’ll find ways to work those things in, too, but for the moment stop and celebrate the mundane with your kids. Let them learn from your trip to the bank or post office, from watching and helping you plan meals or do housework, let them explore their everyday environment. Education lives in those places so much more than we realize. CARISSA: That’s almost as bad as the one that gives all of the directions for standing in a perfectly straight line. AMIE: Just last week I witnessed children being congratulated for being so neat and staying in the lines with their coloring, being told they were “coloring like a Kindergartner.” These were three- to five-year-old kids and my heart went out to the ones who were enjoying what they were doing and not staying in the lines or using the right colors (according to the instructor)—my daughter being one of them. If this had been a long-term class, we wouldn’t have stuck around. I think if your kids don’t notice, great. But if they do and it bothers them it’s perfectly fine to teach them to stand up for themselves. AMY: Thanks for the encouragement, Mari, I am truly amazed at all the my sons know (even the baby who is 11 months!) and have learned just by living and playing and listening and asking questions and talking with each other. Yet somehow I sometimes fall back into thinking maybe we should go through some kind of curriculum in some relaxed kind of way. But do you know who always pulls me out of those thoughts?! My husband! I guess I have talked about unschooling so much that now he reminds me of all the things I have previously shared with him. He has always supported all of my non-traditional ideas, though I’m not quite sure he knew what he was getting into when he married me—ha! Lydia, I think it is a great idea to teach our kids how to respond in the way that you taught your daughter. I am going to have to remember that and use that in the future! PAMELA: Since it’s a public school, I don’t see a problem with teaching the kids what most people expect. It might not be a real life skill (and then again, it might be), but they will need it. As long as they are allowed to be creative at times, I’m not going to fall apart over one rubric. I think, as unschoolers, we enjoy the best and are sad for kids who can’t also unschool, but it doesn’t make everything the public school does tragic, either. MELISSA: This is such a great thread. I was teaching in a Kinder group at church and a little boy was uninterested in coloring and I could feel that he had a wall up. I told him he didn’t have to color and immediately his body softened and he smiled. It did make me sad that we make church so much like school. It’s hard enough for school kids to have to live through all of that conformity during the week then also have to put up with it on Sundays when they are supposed to be learning about God’s love, freedom, and grace! Another story I thought of while reading this thread a time when my boys were probably five and three. We had been invited to a friend’s house that day and she brought out the play-dough for them. My boys immediately started building with the different colors of play-dough and she said, “Oh. We don’t mix the colors.” I looked at her and said, “Well, we do!” LOL … we didn’t go over to play again. CINDY S: Thought I’d share what my son did before I knew what unschooling was. I’d give him a math problem or be working on his writing and he’d draw a whole scene on his paper about whatever it was we were working on, and it would take forever, but I just let him and am so glad I did! When he finished his “scene” then he’d be ready for the next word or whatever. MICHELE: When I had my first son, I was the “don’t mix the colors” mom. LOL It drove me nuts, especially because my first son loves colors, and he himself wanted to be able to choose colors. Once he mixed them he wouldn’t play with his play dough as much until I bought new play dough. Now the lesson could be that I don’t buy more play dough, but I would rather him create than not. So, I bought a lot of play dough! Second son totally digs the “army green gray” color that happens when you mix them. By the time he was old enough, I got over my “don’t mix the colors” issues. LOL Third son mixed them too but loves color as well! None of my boys liked crayon coloring especially “in the lines” or anything already drawn for them. Third son is doing it now on his own, probably because we unschool and we didn’t push it. And yes, I hate that church acts like school…grade separation, coloring, learning style, etc. Once we started unschooling, my eyes opened up to the realities of true learning. My youngest is five, and he would never participate in coloring until recently. Now he loves it but creates his own stuff! TRACI: The closest I come to this sort of thing is when they are turning all the paint or play dough brown and the next person to paint might want separate colors. Even then I don’t care truly. Just trying to teach them to be thoughtful. ANGELA: I don’t think my kids even realize there is such thing as in the lines. LOL. Most of the time they choose to use computer paper and color. MELISSA: Michele, I bought a lot of play dough when my boys were little! LOL about that awesome gray/green color! Thanks for letting us share this unschooling conversation!